Sweet music, the teacher of hearts. Gathered together in a modern Nissen style hut behind Harrow Arts Centre on a cold Sunday in February, some fifty souls united with their corporeal forms to bear witness to the debut performance of The Good Disciples, a trio specialising in the expert recital of traditional Indian music, imbued with exploration, improvisation and new composition and comprised of Kiranpal Singh master of the Santoor, Shahbaz Hussain, master of the Tabla and Fabrice DeGraef, master of the Bansuri flute. Three masters do magic music make. Having learnt their craft from their own maestros and masters, Singh from the legendary Pt Shiv Kumar Sharma, Hussein from the great Ustad Alla Rakha Khan and DeGraef from Pt Hariprasad Chaurasia, these Good Disciples of the muse and tradition of this sacred and special music form the latest offshoot of R. Rovers’ Elfic Circle Project and those artists specialising in the musical explorations around Youth’s new world music label. They appeared under the banner of PRSSV, specialist promoters of new and traditional Indian music, produced and promoted by Anjan Saha and Dr. Frances Shepherd. Over the course of a couple of hours to an enraptured audience of enthusiasts and students of the music, a world and community were gracefully formed and quickly ignited by the powerful forces at play. 2017 marks the 50th anniversary of the seminal album Call of the Valley by Shiv Kumar Sharma, Brijbushan Kabra and Hariprasad Chaurasia, and this recital heralds the recording of a new album in honour of this, to be produced by Youth at his world renowned London studios after a thrilling week in which they will rehearse and compose new music at PRSSV Music Archive Centre and The Music Room, Wembley. Today bore the first fruits of a week’s rehearsal and shaking the tree of endeavour. 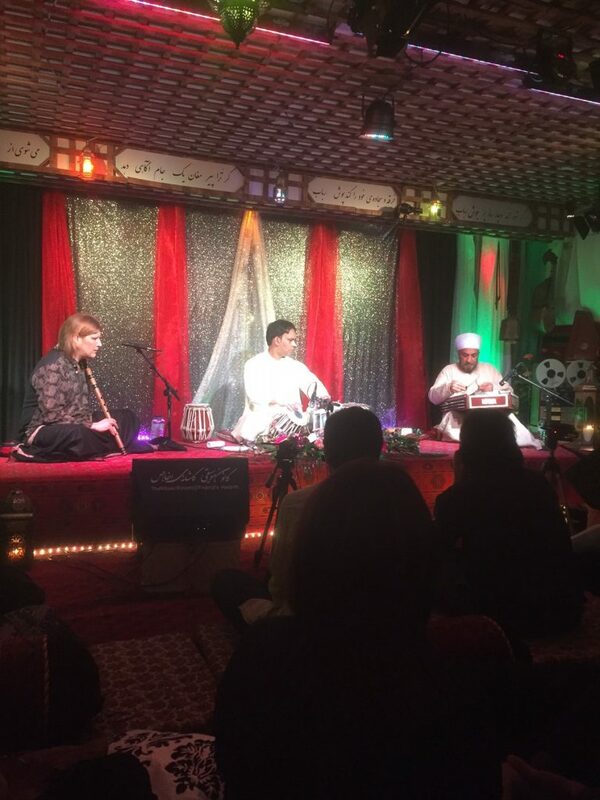 Coming together from different parts of the country and hemisphere, DeGraef initially fell prey to the betrayals of the London transport system, leaving the first half of the recital to become a duo of tabla and santoor. From the first strike of string and drum, sounds of eerie permanence infiltrated the somewhat temporary nature of the space. The santoor is an orchestra in itself and the expressiveness and magic conjured by the striking of its strings is revelatory. As an instrument its resonance is remarkable, as effective as any synthesiser can be or brace of winds, or violins. It speaks directly to the heart and the head, while creating a language for the soul which Hussain’s dextrous tabla playing instantly emphasised with his striking palette of colour and intonation. The opening two pieces, lasting some twenty minutes each in length bare the common Indian names of Kilvana and Alab and take the form of explorations along and across melodies and harmonies on given ragas. The raga as the main template for Indian music acts as a kind of mothership for its musician settlers to dissemmenate from and return to, much like an expert jazz player will evolve a standard song. Once we recognise that there is a commonality across forms and backgrounds we are able to access all types of world music as sciences, practices and languages in their own right, separate even to their background. In this way, so called traditional pieces are renewed each time they are played, no matter how familiar and those listening can therefore experience them again in a completely new way. For the celts and English, Danny Boy is always Danny Boy, but here a new Dhani is birthed. That the santoor is struck with such grace and admits such power is impressive enough, but one is never quite prepared for the mysticism on offer. Kiranpal Singh is the most gracious and down to earth of men and moments before he began playing we were discussing the merits of a Clapham made club sandwich, so the element of transportation and magic in his fingers is one to be treasured and praised. Hussain’s fingers are no less impressive. His tabla playing was incendiary, making him a Carl Palmer, a John Bonham, perhaps even a Keith Moon of his drums. The power in his hands and digits would put any rock player, or for that matter, any athlete to shame as the strokes and strikes of the tabla skin necessary to play it properly demonstrated the class and sheer range he has to offer. At one point he broke into an impromptu solo recital and brief teaching session, demonstrating the capabilities of his instruments that had his entire audience rapt and held, from elderly observers to those wriggling free of their prams and the sense of a community fired on by such a powerful force was heart warming to think of in reflection and invigorating to witness first hand. A seven beat improvisation followed, lasting nearly forty minutes that took the small room from the rain wracked ruins right to the foot of the mountain, guiding those listening ever higher in scope, fulfilment and entertainment. The partnership between the two men was extraordinary. One could see the tacit understanding between them as Shabaz’s fiery, adolescent power was allowed to build through the support of Kiranpal’s stately elegance. They filled in and balanced the opening half of the concert with the kind of grace lacking in the surly attitudes of which pop and rock are formed, an attitude that places players like this in an entirely different league. After the betrayals of the city, DeGraef’s arrival led to the second half of the concert in which the full trio played their new album, along with ensuing variations and explorations. Formed around a composition called Charukeshi, the beauty of the Bansuri filtered through us with an almost visible force. As tender and noble a sound as that produced through it, I have not heard. It is, in essence, a true sword for the soul. That a musician can arrive after hours of stress and immediately conjure such beauty and artistry is testament to DeGraef’s skill but also shows how musicians of this stamp are the most superior of artists. Actors are always affected to some degree by their situation and often try to use it. Artists often exploit theirs or form their works solely from them, whereas it seems to me that musicians have a completely different discipline and these disciples in particular have brought a huge sense of force to the good. Sitting cross legged on a series of cushions, Hussain was placed inbetween Singh and DeGraef and the enjoyment and understanding the three men shared was as appealing as the music they played. I watched Shahbaz Hussain’s obvious joy as he represented through his playing the heartbeats of an entire population while their voices and experiences were channelled through the wood of the flute and their souls deepened, colouring the room and air within it through the resonance of the ‘santooring strings’ and the deep musical spells that it casts. It was sound that you could taste, see, touch and smell, so physical was its presence. Art should be about creating the undeniable in all of its forms, and so it proved here. In short, the recital showed what a real connection in a band can be, as well as a comment on form. Due to the sadness of the passing of two of its members I was put in mind of the fact that here was a kind of soulful and acoustic ELP in one way, albeit one with none of that groups indulgences. Now that the sweet voiced and acoustic driven Greg Lake is dead, along with the classically saturated anxieties of Keith Emerson, a trio of players is key to our understanding of musical language. We are forever searching for the perfect combination across the forms, styles and genres, whether it is guitar, or piano, bass and drums in rock or jazz, or violin, viola and cello. The equation, the balance seems right. The Good Disciples have discovered the answer because they know it already. They follow the truth of the sound from its origins in the land, mountains and spirit of a given or imagined place, right down to the universal musical statement of melody, harmony and rhythm. Like the three acts of a well made play, or the conventional beginning, middle and end of a story, their quest is the simple unification of forces. Here in this handful of pieces and variety of explorations across two and a half hours of playing and demonstrating, their journey showed us that no matter where we find ourselves, Heaven and Harrow have the potential to be the same place; the location for the settling soul. My thanks go to these expert practitioners and to the producers and promoters who presented the music of one world and allowed it to influence the space of another. Sense what you can through these words and examine the space for these sounds. Now your own quest has started. You must learn how to equal such love. A purety shines, borne by sound. As anything found or forgot. Both the warmth of within and light shared. Between strangers tonight, there is a form of communion. With its particular monarchy sourced by care. Like swallowing a star inside dreams. In which the stresses of day find release. And yet each has their moment. What music is, when allowed. Is a bird across cloud as light folds. Of the changing air in his flute. And the astral are gracefully passed underfoot. On which the shimmering moon finds its place. As her man moves to make his return from this land. That the head, heart and soul understand. This entry was posted on 23 February, 2017 in homepage and tagged Anjan Saha, Brijbushan Kabra and Hariprasad Chaurasia, David Erdos, Dr. Frances Shepherd, Elfic Circle Project, Fabrice DeGraef, R. Rovers, Shahbaz Hussain, Shiv Kumar Sharma, The Good Disciples, youth. Bookmark the permalink.